Lou Reed and Metallica’s first collaborative album Lulu delivers grating guitar riffs with morbid and morose lyrics, creating an overwhelming sound that’s essentially unlistenable. Bonnie Horgos talks about McDonald’s and why having a cheeseburger every once in a while is not a bad thing. 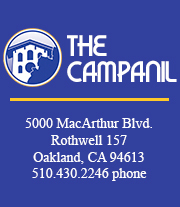 Bonnie is the former Features Editor for The Campanil. She studied music and journalism and has interned for the East Bay Express and the Santa Cruz Sentinel.